The key to successful disaster relief in Haiti for us has been working with a local business owner/humanitarian and utilizing an informal aid network of his employees--many who have lost their own homes and loved ones. 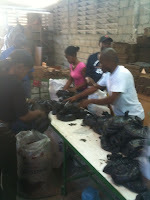 This pic was taken this morning of our 3 volunteers working with Haitian aid volunteers in the warehouse. All morning they were busy breaking down food supplies our foundation purchased into distributable family-size packages. 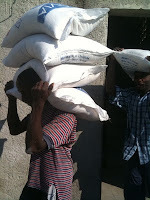 The food packages were distributed the same day to people who have not received aid at their camp. With the local lay knowledge, or in other words, local help, we are able to deliver aid quickly to those who need it the most. We (with our Haitian friends/aid partners) have found several small (300 or less) camps of homeless earthquake survivors who have not received aid. We have distributed our family food packages to them using the food ticket system, peacefully. We alerted an representative of the US Army of their locations so these families can get adequate food and water after we leave. 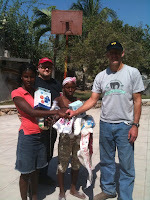 Working with the Haitians has created disaster relief aid distribution that is efficient and that works. The aid packages were comprised of supplies requested by Haitians--they contained culturally appropriate foods, water and requested essentials such as water filters.These were emergency supplies they said they needed until more sustainable solutions can be found. The conditions in PAP are very challenging due to the totality of destruction and dense population and development. It is taking literally hours to drive a few miles and get anything done. The international donations of food and water has made it to PAP but the problem is getting these essentials to survivors. That is the situation. On a positive note: Mobile phone service is good in Port-au-Prince. I have been getting text messages, photos, & calls free from my husband's iPhone courtesy of AT&T (until end of Feb we were told). Our donors and family members of volunteers are getting updated with photos & texts in practically real time. The biggest challenge is moving relief supplies from warehouses in PAP to families who need help in the hundreds of informal aid camps.